#BlackLivesMatter: Combing Through 41 Million Tweets To Show How The Hashtag Exploded : Code Switch A new study by three media scholars reveals how the social protest movement spread on Twitter, with some fascinating — and sobering — findings. The protest movement that has sprung up around police violence and criminal justice reform first spread like wildfire online, which researchers say allowed activists to circumvent traditional new media to get their message out. 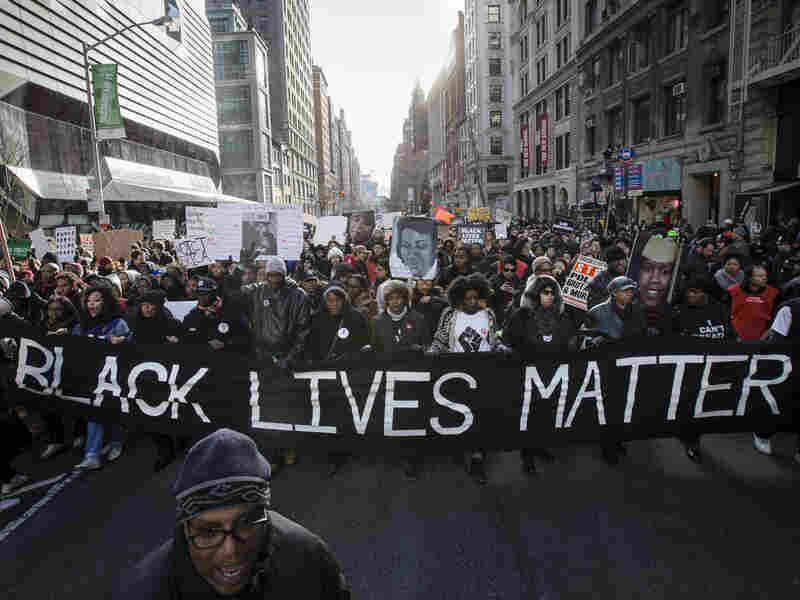 It's been only a year and a half since the social protest movement around police violence commonly referred to as Black Lives Matter emerged as a major political force. Much of this movement's momentum-building and organizing happened on Twitter, and a fascinating new study by media scholars Charlton McIlwain, Deen Freelon and Meredith Clark mapped out how it happened and who drove. The researchers combed through Twitter data from June of 2014, just before the police killing of Eric Garner in New York City, through May of 2015, shortly after the protests over the police killing of Freddie Gray in Baltimore. From nearly 41 million tweets, 100,000 Web links and dozens of interviews, they were able to map out who led the conversations and how they were connected to each other. The researchers dove deep into the roles played by each of these groups and how the conversation evolved over time. Here are some of their biggest findings. The hashtag #BlackLivesMatter was created in July 2013, around the time of George Zimmerman's acquittal in the shooting death of Trayvon Martin. But the hashtag sat quietly for a long time: the month before Michael Brown's shooting in early August 2014, it was only used a total of 48 times a day across Twitter. Freelon, one of the study's authors, said it was being "kind of used in a generic way," with mostly affirmative messages that weren't necessarily even political. Come August, though, the hashtag was used more than 52,000 times. And that was only the beginning. "You can actually see the day it goes mainstream — Nov. 25, the day that the decision not to indict Darren Wilson came down," Freelon told me. In the first 20 hours of that day, #blacklivesmatter was used on Twitter about 10,000 times. In the four hours of that day following the verdict, it was used 92,784 times. "If you remember, there were a number of other hashtags that were jockeying for supremacy — #handsupdontshoot, #icantbreathe, #justiceforall," Freelon said. There were also the hashtags made up of the names of individual people killed by police. "What's interesting is the one that [won out] was the one that framed these stories in explicitly racial terms." Another fascinating tidbit: The prominence of the Michael Brown case, relative to some other stories of police violence, is somewhat counterintuitive. The incident that led to Eric Garner's death was captured on video and took place in New York City, the nation's largest media market, while Michael Brown's death was in a tiny suburb in the Midwest. Yet, while #ericgarner was appended to about 4.3 million tweets in the study period, #ferguson showed up in 21.6 million tweets, and #michaelbrown/mikebrown was used in about 9.4 million. Freelon noted that conservative clusters on Twitter were also very active in conversations about police violence. Of course, their perspective — and their hashtags — were very different from those used by other activists and young black people. "They've got ... #pantsupdontloot," he said. But when researchers plotted out these networks on Twitter, they were surprised by the amount of interaction they saw between conservatives and anti-police-brutality activists. "Black Lives Matter shares a lot of connections with conservatives, which is very interesting," Freelon said. Of course, Freelon notes, many of these encounters were contentious, but he also pointed out instances when folks in both of these universes found themselves in some form of agreement. For example, he said, many conservatives recast Garner, who suffocated and died when police wrestled him to the ground while trying to arrest him for selling untaxed cigarettes, as a tax martyr. And people of all ideological stripes condemned the officer who killed Walter Scott, who was shot in the back several times as he ran away after a traffic stop. "I was vaguely aware that some conservatives did a 180 around the Walter Scott and Eric Garner stories, but I was surprised at the prominence of the voices," Freelon said. "You're not seeing 'Eric Garner deserved it' or 'Walter Scott deserved it.' It was more [arguments about how the bigger problems were] abortion and black-and-black crime." Black Lives Matter, the organization, was founded by three black women, and Twitter is a space in which the fascinations and voices of black women carry particular weight. But when the researchers looked at who comprised the "high centers," or most influential connectors, in the networks most involved in discussions of police violence, they saw something different. "If you look at the top 10 ... it's half activists ... some media folks," Freelon told me. "You'll notice that only one of them is a woman," he said, referring to Johnetta Elzie, @Nettaaaaaaaa on Twitter, who was profiled in the New York Times and co-edits a prominent newsletter focused on race and policing. Many of the people who rose to prominence did so out of relative obscurity. DeRay McKesson, who is at the top of the "high centers" list, is a perfect example. Before the protests, "he had fewer followers than I did," Freelon said. "He moved from that to doing Colbert in a year and a half." It's hard to game out just why certain people became influencers, and others didn't. "You're talking about a bunch of people on Twitter making a bunch of individual decisions about who to retweet," Freelon said. "You're kind of at the mercy of the cloud." Still, he said, when it comes to women and the movement, we could be seeing offline attitudes replicating themselves in the aggregate of the Twitterverse — like the way new stories tend to quote male sources much more often than they quote women. "It just goes to show that when you have a big movement," even one that's ostensibly committed to doing things differently, and better than in the past, "you might end up falling back on these old institutional biases," Freelon said.